This week Lani learned that she will be training two ASL sisters fresh from the MTC starting mid Feb. She has mixed emotions about this as she LOVES the Seneca Ward and her new companion but she is over the moon excited to serve in a deaf unit and use her ASL more. The ASL missionaries had a meeting with the mission president this week to plan for three new missionaries that are coming to DC on Feb. 18th. 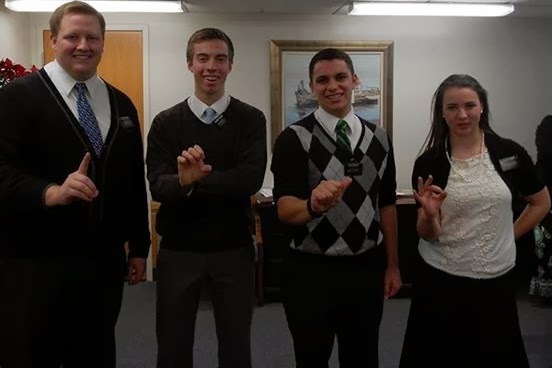 Elders Schoemig and Winkler are going home at the end of this transfer and Elder Wood and Sister Bascom will be receiving the new ASL missionaries. Elder Wood and Lani were in the MTC together. He saw the sisters signing amongst themselves and introduced himself. He was not called as an ASL missionary but he has members of his family that are deaf and knows ASL. He was hoping to be able to work with the deaf too. She is being given a huge amount of responsibility with these next two transfers. Not only will she be training. She will be having to get to know deaf members spread through out the whole mission and beyond. She will be fully immersed in a signing environment and is still learning how to serve in a more traditional way as a missionary. Please keep her in your prayers.